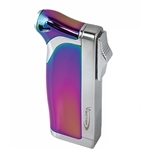 JetLine Paramount Double Torch Cigar Lighter Chrome/Brown with automatic flip top lid and side mounted trigger, all shipped in an attractive gift box. 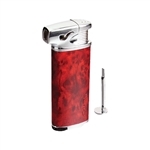 Durable and attractive design featuring a state of the art piezo electric quartz crystal ignition system and wind resistant flame. Perfect when on the go; the wind resistant flame is ideal for outside use whether boating, hiking, fishing, the course or just about anywhere.